Happy new year one and all! I am here with the review over Panic! 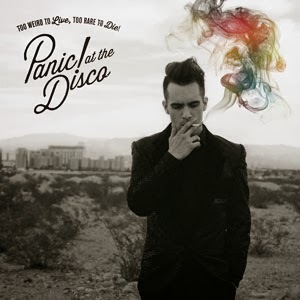 At The Disco's new album Too Weird To live Too Rare To Die Album that released on October 8 of 2013. Later on I will review the bonus tracks on their Deluxe edition that is only available at Target. So, How about I began with the two songs that came out as singles. Miss Jackson Feat Lolo, and This is Gospel. The first time I heard Miss Jackson the tune instantly got caught in my head, and I found myself singing it at random. The idea of using a girl to sing the chorus is ingenious even if it's talking in third person. To know that it was based off a true life learning event that had happened to Brendan Urie makes the song all more real. This is Gospel has to be my favorite video from Panic! At the Disco to this date. Watching behind the scenes of the making of the video was truly a treat to the internet. The song expressing that of a relationship that is unrequited and the person singing the song stating that they need to let them go. Also using the lyrics "If you love me, let me go" is truly amazing. This is truly a cliche thing said but it is a true statement. Sometimes when you love someone so much, it's best just to let them go. Listening to the rest of the album, I have to say that I am very impressed. Panic! tends to bring out new tricks every time. A new style which makes me fall in love with them over and over again. However, some fans may come to disagree. Skimming through some of the comments on a couple of the music videos, some fans state that they hate that it didn't sound like their usual stuff. The song Girls/Girls/Boys has caused a lot of controversy on the internet, which is quite surprising because granted he's naked, it's only Brendan from the waste up. It's more of a tease video, which all the fans loved greatly. The album is truly one beautiful creation in my opinion. The album seems to be well balanced with both slow, and dance-type songs. The last song is a beautiful melodic song. I give this album a 10 out of 10. Honestly, I found a smidge of difference in the beats but otherwise I don't think it's that different from their previous things. The band is still writing amazing songs, and performing to their hearts content. Also, seeing them live, I have to say I love when Brendan throws in a little ad-lib into the songs. The band if very charismatic, and it shows in this album. The songs I'm most addicted to has to be Vegas Lights, This is Gospel, and Miss Jackson. Click here to see my review of the bonus albums.